Published: July 18, 2013 at 06:15 p.m. Updated: July 18, 2013 at 08:53 p.m.
Ahmad Brooks' confusing legal issues will end without charges being filed against the San Francisco 49ers linebacker, NFL.com and NFL Network confirmed Thursday. The Santa Clara County District Attorney's Office has decided not to pursue the case against Brooks, stemming from an June 8 incident in which he allegedly assaulted 49ers teammate Lamar Divens. Assistant district attorney Karyn Sinunu-Towery wrote in the dismissal memo that, among other things, Divens could be trying to financially gain from the incident and that Brooks "has a viable self-defense assertion" because of a previously unreported run-in. "The totality of the circumstances demonstrates that the charge cannot be proved beyond a reasonable doubt to twelve jurors," Sinunu-Towery wrote in the memo to district attorney Jeff Rosen, who agreed with her findings. The Sacramento Bee first reported the news. Sinunu-Towery revealed in the dismissal memo, obtained by NFL.com and NFL Network, that Divens asked Brooks two days after the incident to pay him $1 million. That request was denied. Divens told the DA's investigator on July 16 -- more than one month later -- that he didn't want to press charges, but he still wanted Brooks to pay him $1 million. Court documents previously obtained by the San Jose Mercury News said Brooks allegedly struck Divens three times in the head with a beer bottle and then punched him in the face during an argument about Brooks' readiness to drive after drinking alcohol. Evidently, it wasn't their first run-in. Witnesses told authorities that Brooks and Divens also got into an altercation during a May barbecue at Brooks' house. Divens and Brooks were "talking smack," one witness said, and Divens pushed Brooks to the ground, causing a 2-inch cut to one of the linebacker's legs. Brooks tended to his leg, police weren't called and Divens stayed at the party. Authorities inspected Brooks' scarred leg as part of their investigation. Almost three weeks ago, prosecutors received a warrant to arrest Brooks on a felony assault charge with great bodily injury. Officials later said the arrest-warrant request was filed in error. Brooks was dismissed from the University of Virginia's football team after numerous off-the-field issues, but he hadn't run into any problems during his eight-year NFL career. 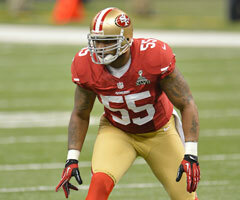 Brooks signed a six-year, $37 million contract extension with the 49ers last year.